A special edition for the five years of BANG! 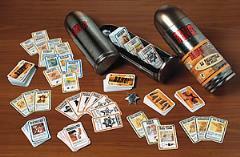 The tin bullet-shaped box contains BANG! third edition, all of its expansions (including the rare HIGH NOON), new cards and a shiny Sheriff badge!